Theresa May has been handed a humiliating Halloween Brexit nightmare with EU leaders agreeing to a 'flextension' that delays the UK’s departure until October 31 at a crunch summit tonight. The Prime Minister also indicated that she believed it was still possible to leave before May 23 and avoid taking part in European Elections. Irish premier Leo Varadkar had earlier said the UK would have to leave without a deal on June 1 if it refused to take part in the May elections. 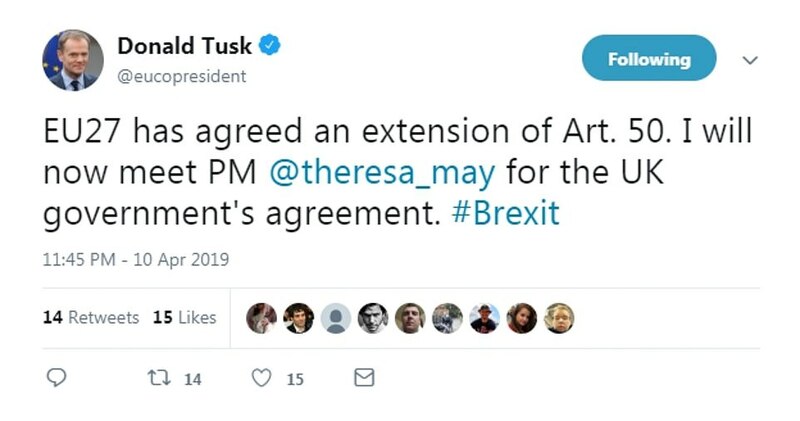 But European Council president Donald Tusk gave Theresa May a glimmer of hope that the UK could leave before October. He told an early-hours press conference that the 'course of action is entirely in the UK's hands'. In a message to Britain he added: 'This extension is as flexible as I expected and a little shorter than I expected. 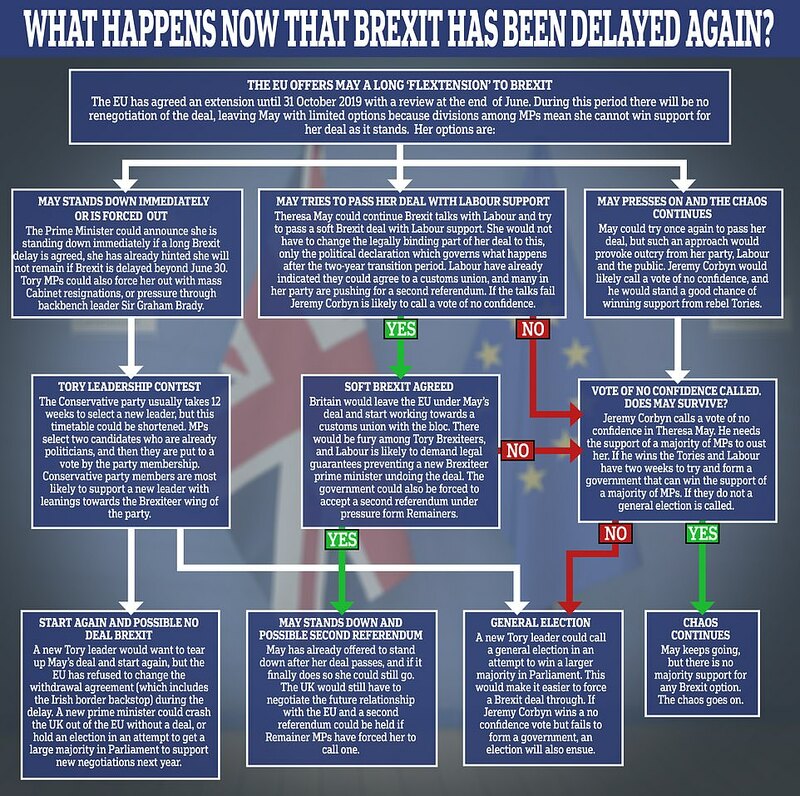 The flextension also raises serious question about whether Mrs May will be in office to oversee Brexit, with mutinous MPs demanding she quit as soon as possible and senior figures already maneuvring to replace her. Reuters had earlier quoted a diplomatic source who said Mr Macron wants to actually offer Mrs May roughly what she wants, telling his counterparts a delay past June 30 would undermine the EU. The source suggested the French were being 'annoying, just posturing to show how important and powerful they are'. They added: 'He is in a bit of a schizophrenic situation - (his) domestic audience demands that he is tough on Britain for historic reasons. Sources suggested that as many as 17 of the 27 had wanted a much longer delay. But the October 31 date is a rough half-way compromise between the two. The Prime Minister spent a little more than an hour this evening in a question and answer session at the emergency meeting before being kicked out while they decide the UK's fate over a lavish seafood dinner. She addressed the European Council session in the Belgian capital after president Macron had warned her that he was 'impatient' and that a long Brexit delay was not guaranteed. He appeared to wink today as he arrived in the EU's core - after being urged not to 'humiliate' the Prime Minister. He was set to demand the UK is subjected to a number of punitive conditions with a Christmas deadline to finally quit the trade bloc, but also raised the spectre of a no-deal Brexit, possibly on Friday. Speaking to reporters ahead of the start of the emergency meeting of national leaders he warned that 'nothing is settled', including a long delay, and he was 'impatient' to hear what Mrs May had to say. 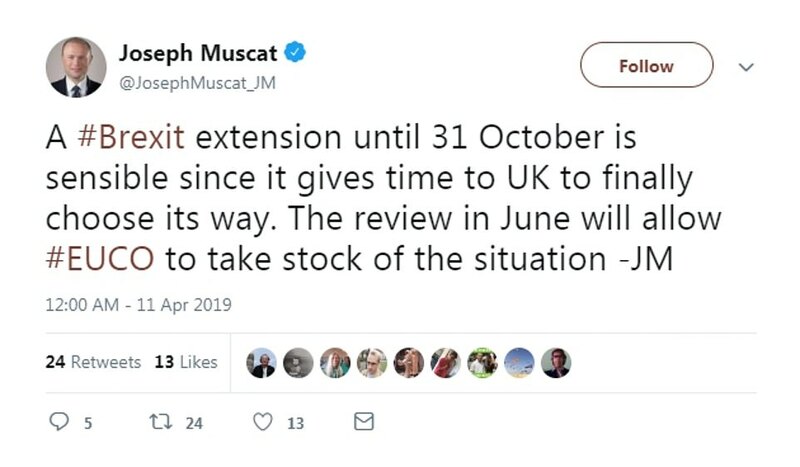 An EU official later told Reuters that the 'sense is May is open to a longer extension as long as it can be terminated early' and her address had been 'more solid than usual, though not many specifics' in it. German Chancellor Angela Merkel - whose mother Herlind Kasner passed away aged 90 just days ago - wanted a gentler, but longer extension, into 2020 - reflecting splits among the EU27. Arriving at the EU's headquarters the PM refused to say if she would quit if Britain was forced to swallow a longer delay - but insisted her aim is still to leave the EU on May 22 if she can win over Jeremy Corbyn. President Macron is also believed to have called for regular 'behaviour reviews' of the UK, a bonfire of its EU powers and posts and a 'Boris-proof' lock preventing a new Tory leader causing havoc within the EU if she stands down, despite warnings from Donald Tusk and Angela Merkel not to poison relations with Britain. Before taking off for Belgium a frustrated Theresa May blasted MPs for not voting through her EU divorce deal after Tory Eurosceptic Henry Smith accusing her of throwing away £1billion-a-month in payment to Brussels if she accepted a longer Article 50 extension tonight.